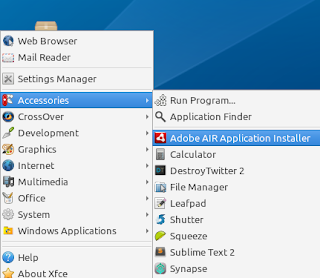 Recently, I wrote a post on how to install Adobe AIR on Ubuntu using Deb package. 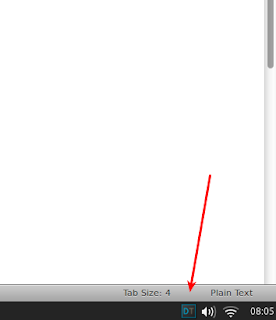 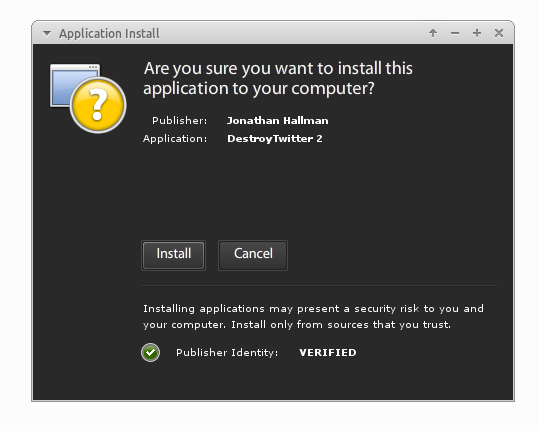 Now, I'll show you one of many Adobe AIR applications out there, DestroyTwitter! It is a powerful and lightweight Twitter Client built on Adobe AIR technology, it means that you need to install Adobe AIR to run DestroyTwitter, click here for the tutorial. 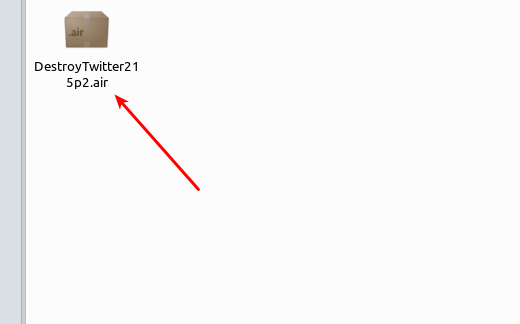 DestroyTwitter has a lot of features but while leaving small footprint (25MB) and its installer is less than 1 MB. 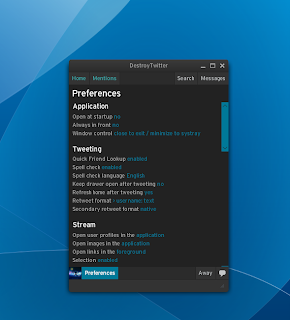 All features of DestroyTwitter come in one window, you can see recent tweets, mentions, search, messages, and even preferences from its main window. 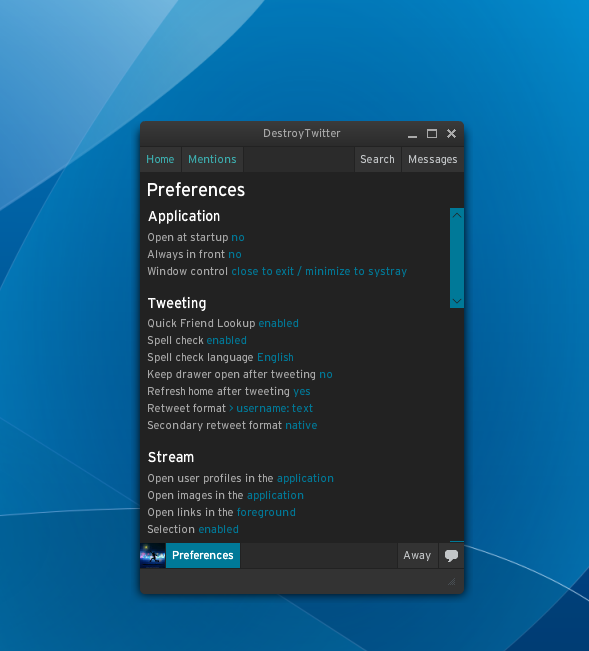 The preferences page is everything you need to control the behavior of DestroyTwitter. 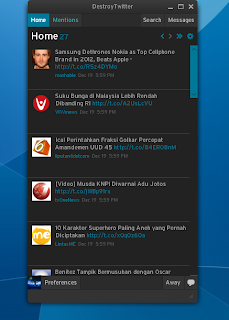 You can change stream behaviour, sound notification and position, change font size and change the look and feel of DestroyTwitter. 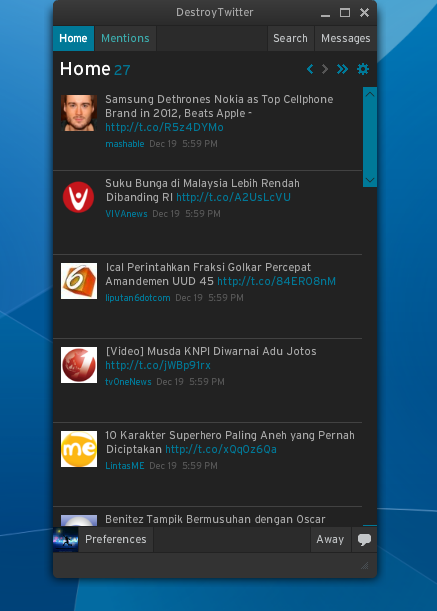 When you lost focus of the application, it will notify you about recent tweet in a beatiful way by showing smooth notification on the top of scree (you can change the behavior in preferences page). 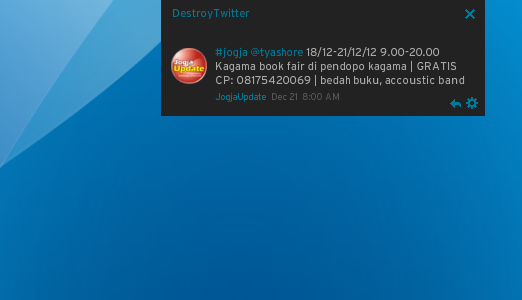 DestroyTwitter will sit on notification area when you click minimize, so you will never miss important tweet while you are working. Please download the ZIP file here, once downloaded, extract the file and you'll get an AIR file which can be installed via Adobe AIR application installer.